'The fact that I'm a Sibelian would ... certainly explain why I was quite bowled over by the (Rubbra) Fifth' said Philip on Desert island diversion. Philip, do you know the Sibelius influenced (listen to the closing bars) Symphony in G minor by the Norfolk bred E. J. Moeran? The sleeve above is my 1975 Lyrita LP. It is now transferred to CD, alas without the stunning Turner painting 'Storm Clouds: Sunset' The Boult Lyrita account is superior to Tod Handley on Chandos. In fact Sir Adrian's account is one of his many great underrated recordings, and, of course, the Lyrita sound is sensational. I would also recommend the Moeran Violin and Cello Concertos and, indeed, the Rubbra Violin and Viola Concertos. I have the long-deleted Tod Handley Conifer CD of the Rubbra Concertos with Tasmin Little and Rivka Golani as soloists. The two concertos are available separately with different couplings on other labels. And talking of Norfolk and sunsets, there is a A Norfolk Rhapsody here. Well, here is some synchronicity indeed! I took particular note of Rubbra the other day because last week I decided I must get a handle on British composers I simply haven't paid enough attention to. Some, but not enough. And I began with Moeran, listening to all the works in the NML, starting very happily with the violin concerto played by Mordkovitch, which I thought wonderful, and on from there. (This project was interrupted, I might say, by a weekend of sitting incensed at the computer trying to counter the horde of Beijing 'trolls' attaching comments to media articles on Tibet. Paid, blackmailed or volunteering, they are always out in force at these times, especially here in Canada - I'm an ex-pat.) Here and there as I proceeded I heard Vaughan Williams, Delius, Elgar, Bax, Sibelius, but, yes indeed, in the symphony the influence of Sibelius is patent, hitting me at first most forcibly at the start of the slow movement. The final bars of the work I have to take as a frank tribute to Sibelius -- I can't believe what amounts to a paraphrase of the end of Sibelius' Fifth (!) was unconscious. It's a fine work, I think, the better understood, perhaps, if you know Sibelius' method, growing one oak out of a handful of acorns. I listened to Handley's recording -- there is also David Lloyd-Jones in there and I shall listen to that -- but given the nature of the work I can see well that the sure hand and understanding of Boult would make of this something special indeed. I shall get the cd. Your comment about Sir Adrian's underrated recordings is well taken by me -- his Brahms symphonies, for a start, ought to be mentioned in any discussion of great recordings thereof. Many thanks for this post, Pliable, the path meanders splendidly. Or in the Buddhist vein, it is wonderful to go somewhere the way a river goes. Moeran was born in Heston, wasn't he? If you like music influenced by Sibelius, try that of New Zealander Douglas Lilburn, particularly the first two symphonies and the early tone poem Forest (sic). And Stenhammar's second symphony, also in G minor, is eerily similar to Moeran's. John, you are quite right. Moeran was born in Heston. But as nobody would wish to be associated with a service station on the M4 I transported him to Norfolk. Seriously though, my error. He was raised in Norfolk. Where his father was Rector at Bacton, now famous as the terminus for the North Sea gas pipeline - nearly as bad as Heston. I have an LP of Douglas Lilburn's Second Symphony coupled with two of his other works. The symphony is played by the New Zealand Symphony Orchestra conducted by Ashley Heenan, the label is Jerusalem Records. Moeran was indeed born in Heston, John. That couldn't fail to strike me, for I was born in Isleworth and used to go swimming in Heston. I shall surely investigate Lilburn. Philip, I agree that Boult's Brahms Symphonies are gems. Did you know his Brahms symphony cycle was started by making an unscheduled recording of the Third Symphony to use two spare sessions caused by the early completion of his recordings of VW's Job and Elgar's Enigma Variations in August 1970? Other Boult gems worth seeking out on LP or CD are his Brahms Serenades and Schubert Great C Major, his 'bleeding chunks' of Wagner, and a Beethoven 6 with all the repeats. 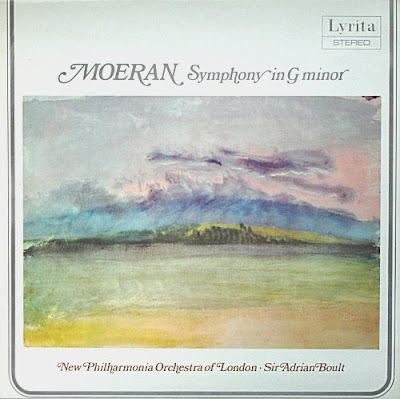 I just listened to Lilburn's Forest, and there we have another tribute to Sibelius' Fifth as frank as the ending of Moeran's Symphony: the motif played pizzicato on strings from approx. 1:00 to 2:50. I liked the work very much -- the symphonies (also from the NZSO and Judd) and much else are just a click away and I am going to enjoy discovering Lilburn. Thanks for this, John. Pliable, I had heard that about Boult's Brahms cycle. I must say that I am glad I have also his recordings of the symphonies from 1953-4. The playing of LPO is not up to snuff, the recordings obviously dated, but I do think the conducting is truly exceptional, Boult at his peak. The Brahms serenades and the Schubert C Major I have -- performances to treasure. I also have a BBC Legends issue (BBCL 4039-2) of concert performances that illustrates wonderfully the point that a truly great conductor ( and this goes for instrumentalists as well, in fact) can work magic in just about any repertoire, for there we have marvellous performances of Ravel's Daphnis, Bizet's Jeux d'Enfants, Schubert's 'Unfinished' and, a real stunner, Sibelius' Seventh.